Mercedes-Benz Active Brake Assist 4 and Sideguard Assist promise pedestrian safety. Mercedes-Benz Trucks has announced two new digital services and two new safety systems which will form part of its range of innovations heading to the IAA commercial vehicles show in September. Targeting the expanding digital presence in transport operations, Mercedes-Benz Uptime and the FleetBoard Store for Apps will head the truck maker’s new real-time connectivity push. Mercedes-Benz Uptime, which will launch at the show in September, is a new service that hopes to increase vehicle availability in day-to-day operations. The service works in three ways; providing real-time evaluation of the truck, flexible appointment scheduling, and information for maintenance and repair tasks operators can perform themselves. According to Mercedes-Benz, the "operator will be contacted actively before a part needs replacing or other repairs become absolutely necessary" thanks to the real-time data collected from the truck’s parts, creating a reduction in "the risk of breakdown and time lost by haulage contractors". "Permanently, data from all the sensors installed in the vehicle are received and the status of the vehicle systems is checked all of the time and continuously," the company says. "When an impending need for repair or maintenance work emerges, the truck relays this information automatically to the server of Mercedes-Benz Service. "The data is analysed and interpreted there in real time. Together with specific recommended courses of action the data are then passed to the Mercedes-Benz service organisation. The service organisation then contacts the customer." When it comes to appointment scheduling and repair information, the company says they will allow operators to allocate maintenance to ideal times. "Reliability and maximum availability are top priority for our customers," Mercedes-Benz Trucks head Stefan Buchner says, and "with Mercedes-Benz Uptime we can considerably increase these requests thanks to real-time data and connectivity." The program has been under tests with 16 fleets across Germany, the UK, Austria, and Poland for two years, testing how 1,400 trucks made use of the technology. Mercedes-Benz says it has been met with "a highly positive response, surpassing the companies' expectations across the board." The interactive module fitted in the trucks that facilitates the connectivity was highlighted earlier this month, with Daimler announcing it will become standard across the Mercedes-Benz, Freightliner, and Fuso brands. The second digital announcement, the FleetBoad Store for Apps, will be an open platform for third-party providers to contribute to. Mercedes-Benz says it will act like an iTunes for the truck transport sector when it launches in early 2017. "This platform is deliberately open by design," it says. "It means that software experts for other industry partners such as bodybuilders, logistics specialists and customers will be able to contribute useful apps for everyone involved in transportation. "The result will be a more efficient road haulage sector overall." The company says other brand vehicles can be retrofitted with the FleetBoard hardware at any time, making it possible for mixed fleet operators to see an overarching picture. Alongside the two upcoming digital innovations Mercedes-Benz announced, it also unveiled two vehicle safety technologies that it says will make roads safer for pedestrians and cyclists. "To date, safety systems in trucks have served first and foremost to avoid serious accidents on motorways and highways despite increasing transport services," the company says. 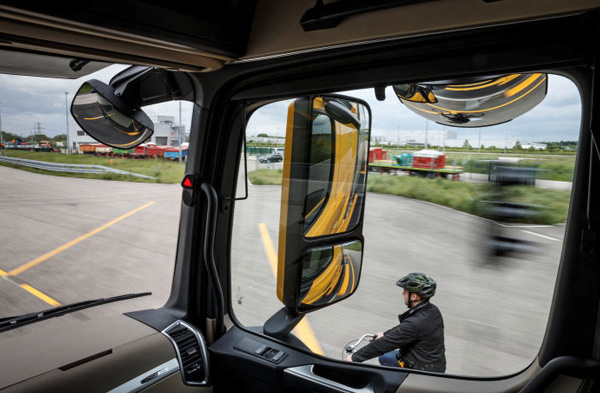 "With the Sideguard Assist and Active Brake Assist 4 Mercedes-Benz Trucks transfers the state-of-the-art safety technology into urban traffic and affords protection above all to the most vulnerable road users – pedestrians and cyclists." 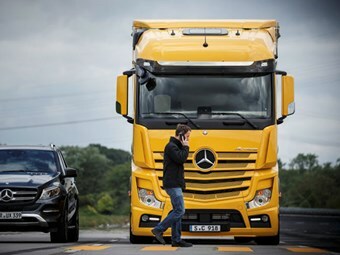 Sideguard Assist is an assistance system that "draws the truck driver's attention to pedestrians and cyclists in cornering situations," Mercedes-Benz says, while Active Brake Assist 4 "detects pedestrians in urban traffic" and automatically brakes. While Active Break Assist 3, its predecessor, initiated braking in response to stationary and moving objects in front of a truck, the fourth-generation technology can respond to pedestrians who walk between parked cars onto the road. "Our customers have always expected us to provide them with the best vehicle in terms of efficiency, safety and connectivity," Buchner says. "And we will continue to deliver that in future, too."